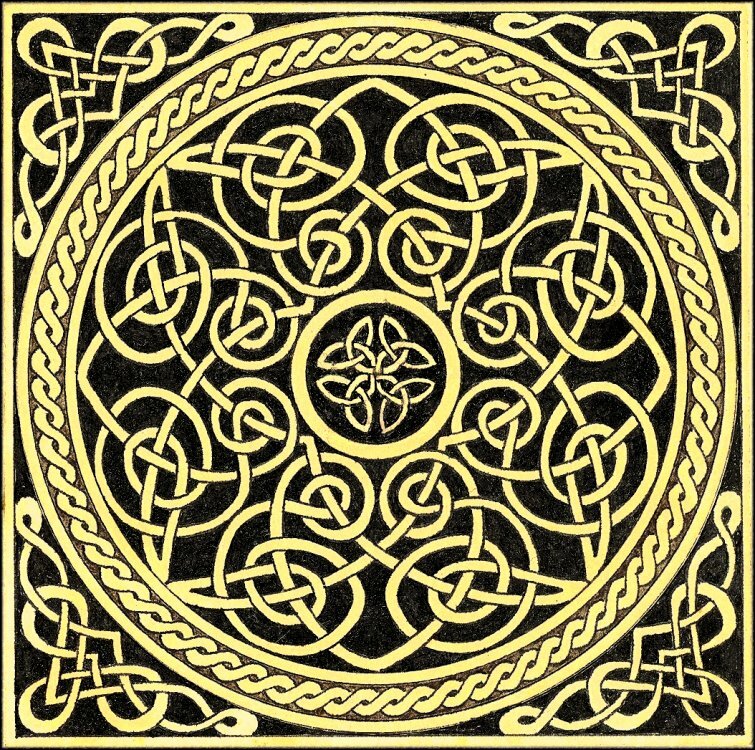 Every planar graph corresponds with a Celtic knotwork, and vice-versa. 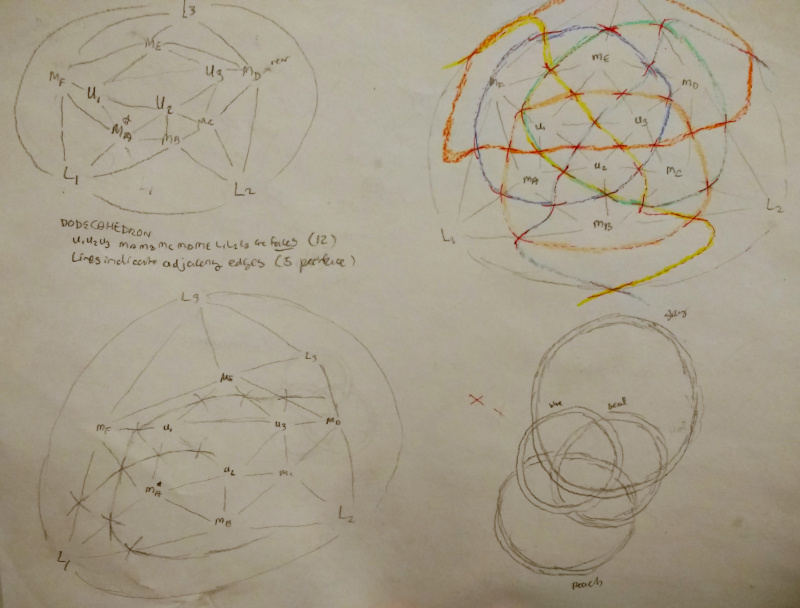 The Mercat procedure shows how to convert a graph into knotwork (see linked page for details); the procedure is precise enough even to be implemented as a computer program. 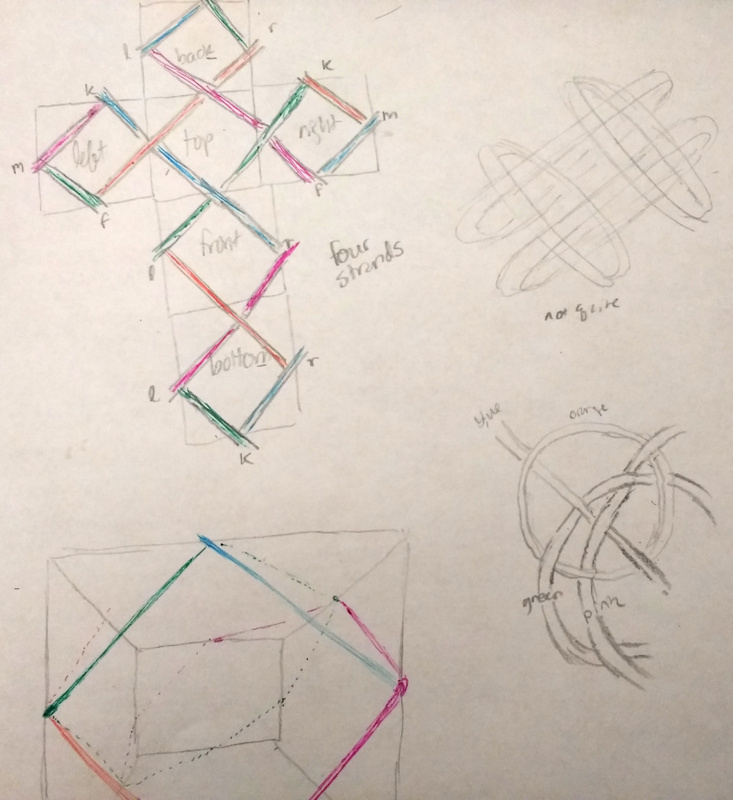 Having discovered Celtic knots, I wanted to discover how various graphs looked when converted by hand into Celtic knots. I chose a straightforward collection of graphs: the five Platonic solids, considered as vertices joined by edges. It was a bit of a struggle for the imagination at first, chasing threads around the corners of polyhedra and visualizing where they would end up. The problem was only partially solved by unfolding the polyhedra, because then threads that vanished off one side of the figure would appear on another in a seemingly different orientation. Eventually, I discovered that I could represent the edges of the graph and their "shares vertex" relationships as graphs themselves. These graphs were all planar, and simplified the Mercat procedure terrifically. Tetrahedron. 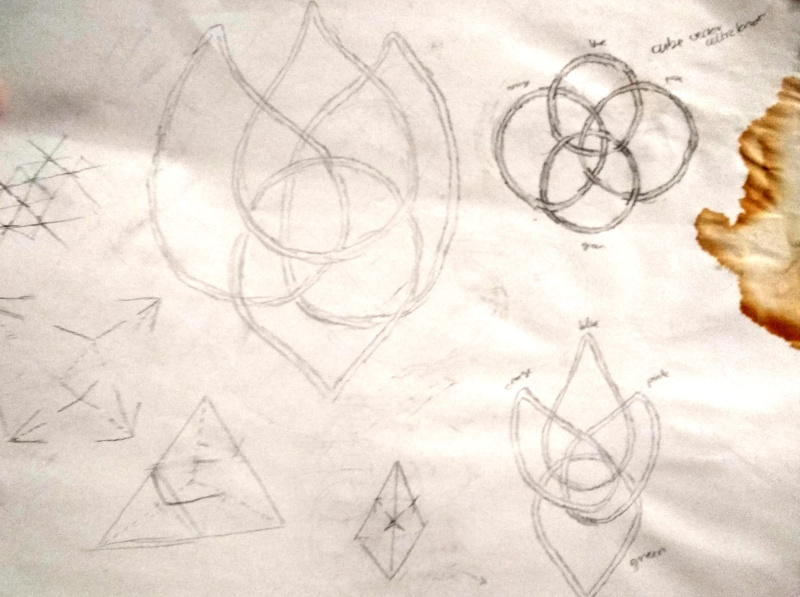 Here, I use my abstract method to draw the knotwork for the tetrahedron. 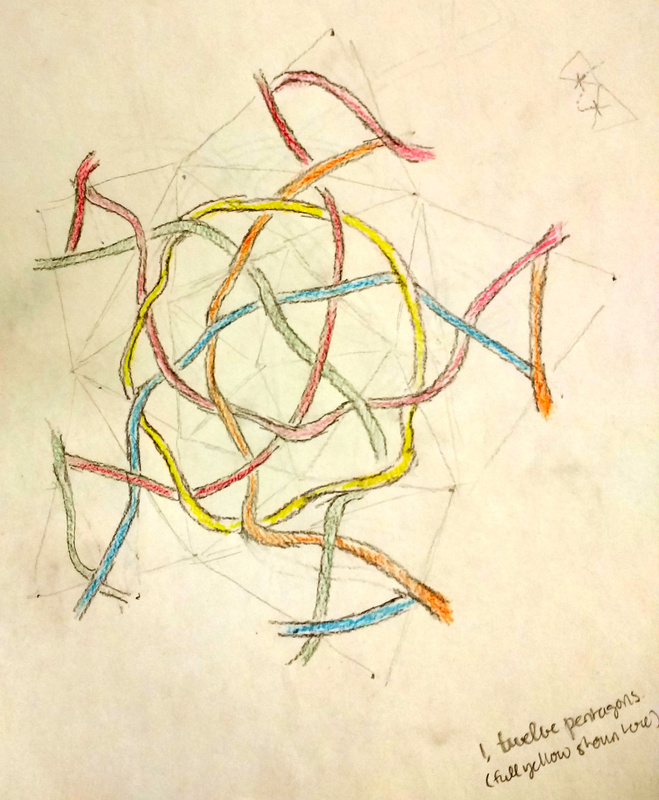 Each node in the graph represents a pair of faces (an edge of the polyhedron), and each edge in the graph represents a shared-vertex relationship. The edges are oriented at various multiples of 45 degrees, as they must be lined up in the final knotwork. Cube. The cube was the first shape I attempted, actually. You can see in the bottom left, I attempted to visualize the movements of the threads in 3D. 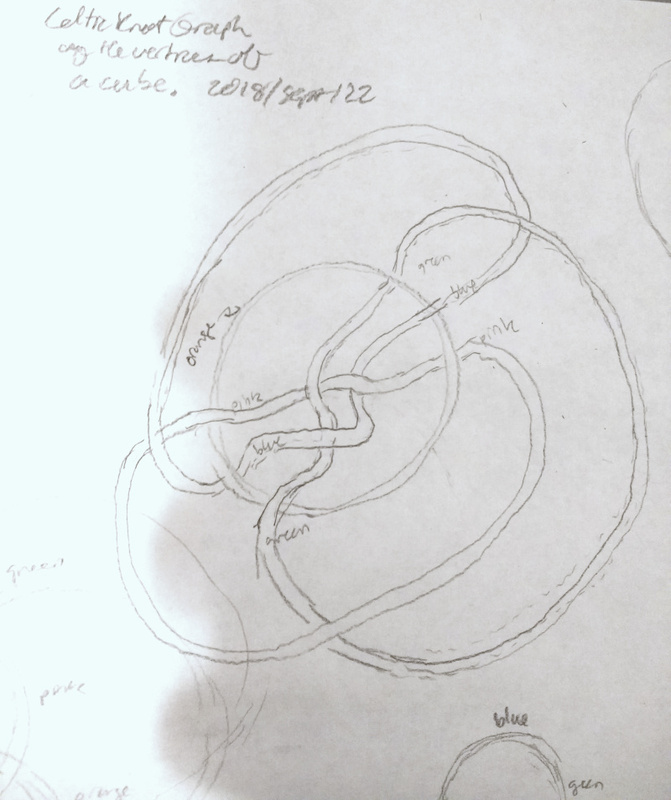 When I looked for a simpler method, I tried unfolding the cube and having the threads "wrap around" as needed (upper-left cross-like figure). The apparent orientation changes (in the 2D unfolding) made this method a bit difficult. 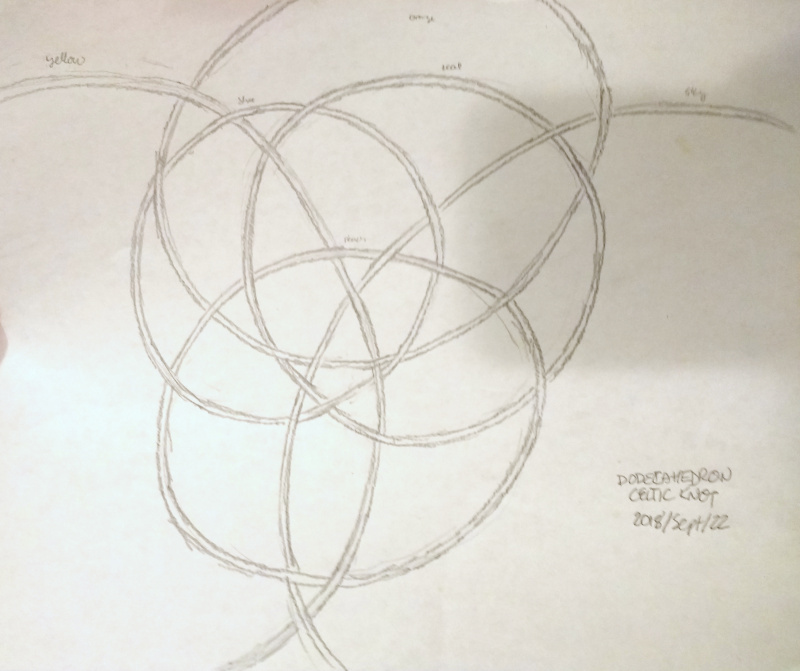 On the right right, I begin to wonder whether I can represent the knotwork as overlapping circles. 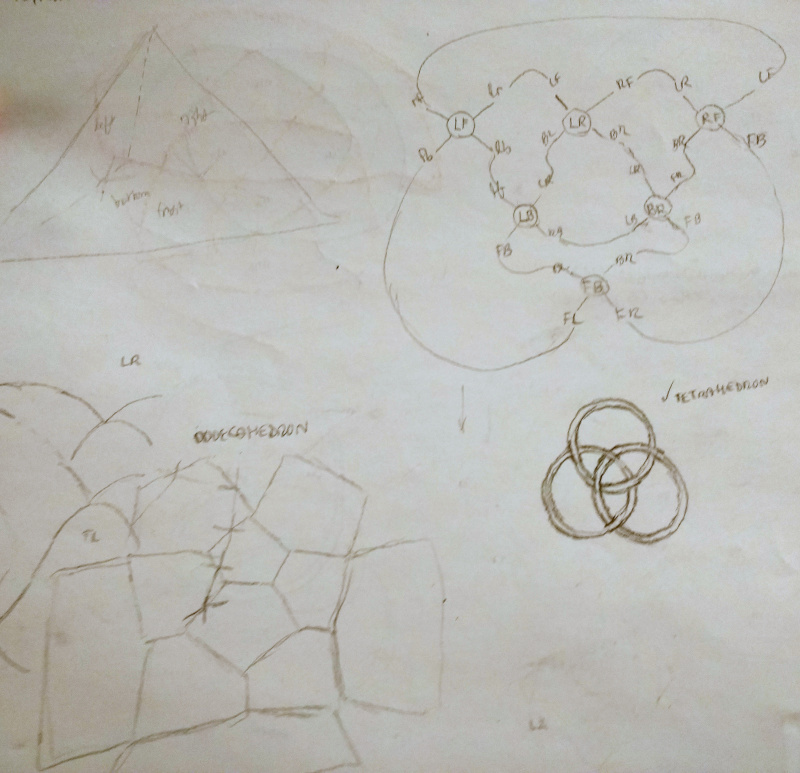 …I eventually succeed at drawing the cube's knotwork (four interlocking circles in upper-right of image below), using the abstract method I developed on the simpler tetrahedron (note some stray tetrahedron attempts around the bottom-left periphery). I rather like the teardrop-shaped aesthetic of the middle incarnation, but the four interlocking circles are more symmetric.